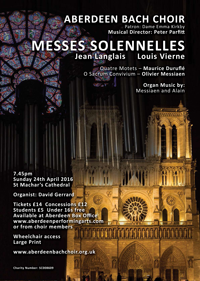 Sunday 24 April St Machar's Cathedral 7:45 p.m.
Aberdeen Bach Choir under its Musical Director Peter Parfitt put on a concert of sacred French Music on Sunday April 24th 2016 in St Machar’s Cathedral. 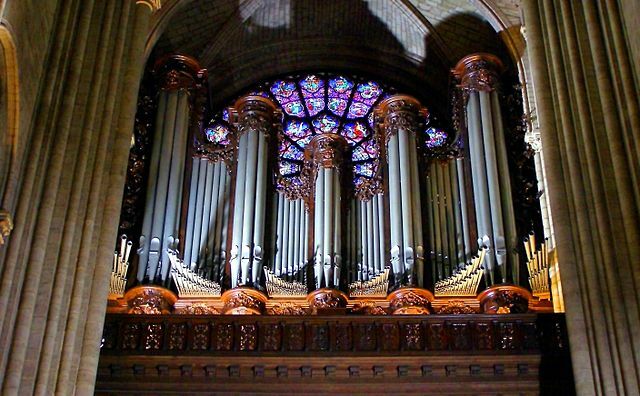 During the first part of the twentieth century two of the principal organists in Paris were Louis Vierne of Notre Dame, and Jean Langlais of the Basilica Sainte-Clotilde. They were both blind. Both wrote mighty settings of the mass entitled Messe Solennelle (the Catholic Solemn Mass) which featured prominently the huge pipe organs in these two buildings. Aberdeen Bach Choir perform both works, along with the Quatre Motets by Duruflé (conducted by Kathleen Cronie) and the beautiful setting of O Sacrum Convivium by Messiaen. The choir was accompanied by David Gerrard, former Organ Scholar of Magdalen College Oxford, who also played organ music from this rich and exciting period of French musical history.